This Demonstration illustrates a mechanical device that constrains a point to move on the surface of a hyperbolic paraboloid. A point on the surface of a hyperbolic paraboloid is equidistant to two skew perpendicular lines and (shown as bars) that are at a distance of 1/4 from the center. The red cylinders represent telescoping bars attached at right angles to and with bearings that can slide or rotate on and . The ends of the telescopic bars meet in a blue point that moves over the surface. Wikipedia. "Pringles." (Apr 20, 2012) en.wikipedia.org/wiki/Pringles. 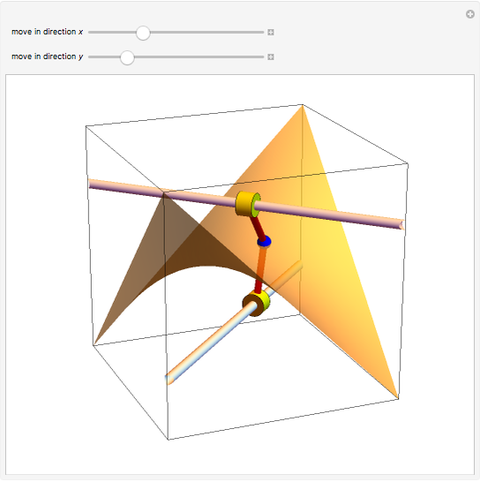 Sándor Kabai "Mechanism to Generate a Hyperbolic Paraboloid"